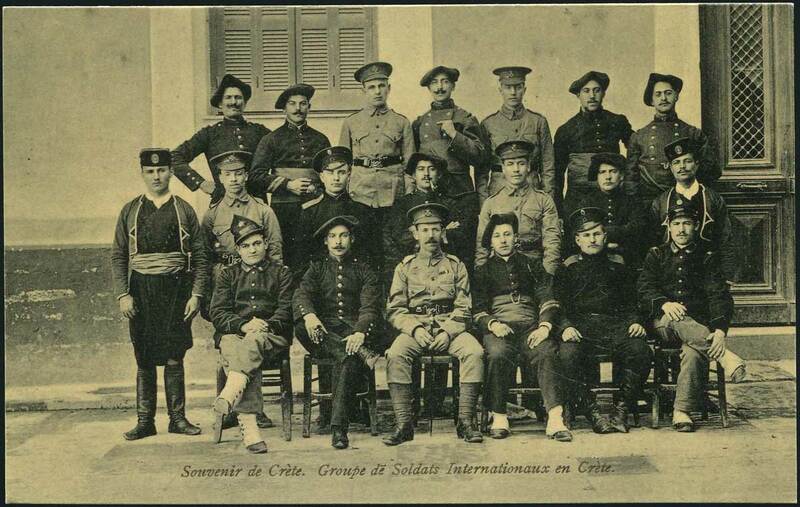 1/King’s Royal Rifles | The British in Crete, 1896 to 1913. Why such a mixed bunch? As well as the 5 British soldiers, this motley crew includes Cretan Gendarmes, French, Italian and what appears to be a couple of less than happy Russians. Judging by the cap badges, the British are serving in the King’s Royal Rifle Regiment which dates the photograph to either early 1905, when 1/KRR served in Crete, or between February 1908 and January 1909 when 3/KRR were stationed there. The location is probably Canea since that’s the most likely place in which soldiers from all four Powers were to be found. It’s interesting to speculate why such a disparate group would be photographed together by a professional photographer, and just who, other than those in the picture, would have bought such a photograph as a souvenir. This entry was posted in British Army in Crete, European Intervention Crete, King's Royal Rifle Corps. and tagged 1/King's Royal Rifles, 1/KRR, 3/King's Royal Rilfes, 3/KRR, European Intervention Crete, International troops on August 26, 2015 by Mick McT.